At AmazingPlans.com, we want our customers to not only recieve some of the best customer service when shopping for house plans, but also the best prices. 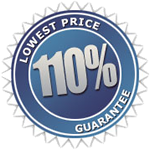 You can rest assured that you will always get the best price thanks to our 110% Lowest Price Guarantee! It's unlikely that you will ever see a house plan for a lower price, however, if you do, let us know! We will promptly sell you the exact same plan at the lowest price, and grant you an additional 10% discount off the lowest price. Our guarantee extends up to 4 weeks after your purchase, so you know you can buy now with confidence. To qualify, simply send us the publicly announced advertisement or exact Web site address (URL). A personal quotation, such as email, does not qualify. Please remember that our 110% Price Matching Policy applies only to exact plans and packages that we offer on our website . If you have found a plan on another website that you would like us to see if it qualifies for our 110% Lowest Price Guarantee, please contact our friendly customer service staff to review the information and confirm your discount and complete your transaction!